Archery and muzzleloader hunters are the first to hit the fields and timber each season in pursuit of big game. Make the most of your hunting season and spend more days afield this year by mastering both of these disciplines. Jim & Trav will be joined by a panel of pros that will lay the groundwork for success with specialized tips for bowhunting, crossbow hunting and muzzleloading. Tune in to hear from Travis “T-Bone” Turner of Michael Waddell’s Bone Collector, as well as Jana Waller of Skull Bound TV and Gordon Whittington of North American Whitetail TV. The Revolution and this guide to archery and muzzleloaders is presented by Outdoor Channel, Sportsman Channel, World Fishing Network and MyOutdoorTV. If you are an archery hunter preparing for the upcoming big game seasons, then don’t miss this week’s two part interview with Travis “T-Bone” Turner of Michael Waddell’s Bone Collector and Realtree Road Trips on Outdoor Channel. T-Bone is a professional and accomplished archer with several championships to his name and countless animals on the wall to further showcase his archery prowess. 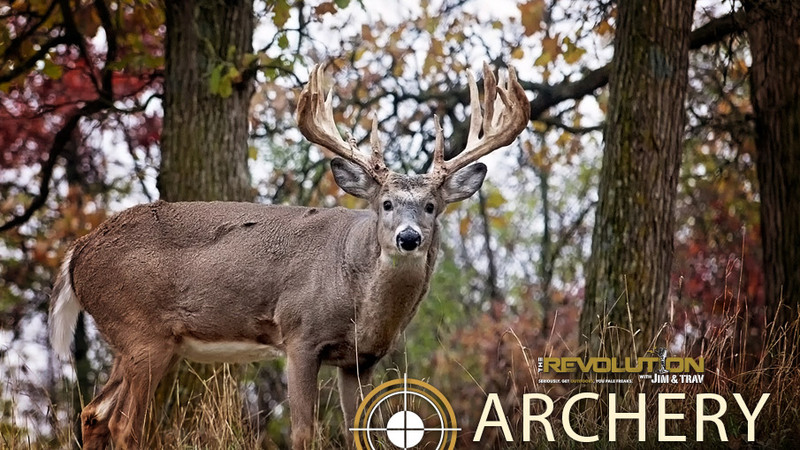 Tune in this week as T-Bone drops some serious archery knowledge on us, just in time to utilize for the upcoming seasons. He’ll discuss broadheads and why he is a fan of the rear deploying models as they don’t starve the arrow of kinetic energy or diminish penetration. He’ll also explain to Jim & Trav what happens when a bow is too fast and what you sacrifice in performance for speed. Finally, T-Bone will talk about using lighter draw weights. “A slow hit is better than a fast miss,” says T-Bone. He’ll hand out some tips for determining the correct draw weight that will help your accuracy and shooting form. All this and so much more! Don’t miss this in-depth archery interview with Travis “T-Bone” Turner. Being proficient with a variety of different weapons can ultimately give you more time in the field by allowing you to participate in different seasons. Jana Waller, host of Skull Bound TV on Sportsman Channel, says that for more than 20 years she has been hunting with archery equipment and rifles, however she hadn’t tried muzzleloaders. Tune in to The Revolution as Jana talks about getting into black powder hunting and how it was easier than she anticipated. Jana says like most she was intimidated by the process; however modern technology has made hunting with muzzleloaders simple and gives hunters the opportunity to extend their seasons. Tune in to find out more about her Utah mule deer hunt and the TC Encore Pro Hunter that she took along. Crossbow hunting has gone from being controversial to a now widely accepted and effective method for hunting, legal in some capacity in almost every state in the country. Gordon Whittington, Editor in Chief of North American Whitetail Magazine and host of North American Whitetail TV, joins The Revolution this week to talk crossbow hunting. Gordon tells Jim & Trav that crossbows are both powerful and accurate, making them an ideal hunting tool for anyone, not just those who physically can’t hunt with a vertical bow. What truly makes any hunting weapon deadly isn’t a caliber, speed or overall power, but rather accuracy and the ability to put your projectile in the vitals. Gordon discusses the benefits of shooting crossbows with a scope and a rest and how it can allow a hunter to be a more consistent shooter. Tune in for more and to hear about a Wyoming crossbow hunt for whitetails that appeared on “North American Whitetail TV.